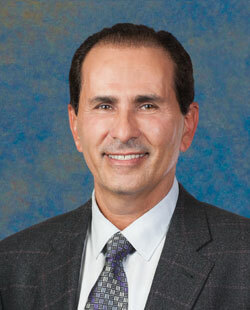 Dr. Ashraf Hanna is a board certified Anesthesiologist and pain management doctor practicing in Clearwater, Florida. He is a graduate of Ain Shams University in Cairo, Egypt. He completed his Anesthesiology residency at Illinois Masonic Medical Center in Chicago, where he spent six months of advanced clinical training in pain management. Dr. Hanna has also completed a Pain Management Fellowship at the prestigious Cleveland Clinic in Ohio. Dr. Hanna had served as President for the Florida Academy of Pain Medicine. He is also a member of several professional organizations such as the American Society of Anesthesiology, Florida Academy of Pain Management, American Society of Interventional Pain Management, and American Society of Regional Anesthesia. Dr. Ashraf Hanna is the leader in the more advanced spinal cord stimulators implants and radiofrequency ablation procedures for intractable low back pain. Doctor Hanna’s pain management clinic is located at our main office in Clearwater, Florida, minutes from the St. Petersburg and Tampa Bay areas.